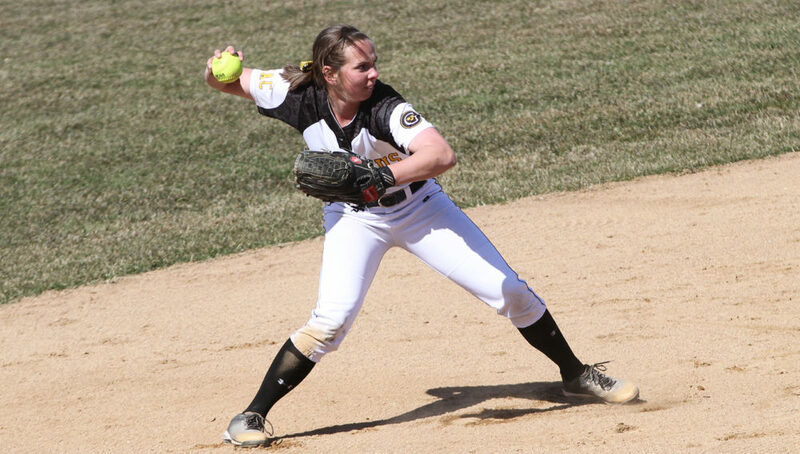 BLOOMINGTON, Minn. – The Minnesota Intercollegiate Athletic Conference announced its 2018 All-Conference Softball Team on Monday with Emily Webb (Jr., Maple Lake, Minn.) representing the Black and Gold with All-MIAC recognition. In addition, Aly Freeman (So., Omaha, Neb. ), Kim Kurtzweg (Sr., Arlington, Minn.), and Ashley Neuenfeldt (Fy., Bloomington, Minn.) were Honorable Mention honorees. Webb, a MIAC Honorable Mention award winner last season, led the Gusties with at the plate during the 2018 conference schedule with a team-high 22 hits in 66 at bats. One of three Gusties to start in all 22 conference games, Webb held down the shortstop position while tallying 66 assists with a .902 fielding percentage. While owning a .333 batting average, Webb accumulated five doubles, one home run, and 10 runs batted in. She was also named to the All-Sportsmanship Team. Kurtzweg, who started in all but two conference games, led the team during MIAC action with a .350 batting average, collecting 14 hits in 40 at bats, including three doubles, five RBI, and a team-high nine runs scored. Also a steady presence in the outfield, Kurtzweg owned a .952 fielding percentage with 20 putouts. Freeman and Neuenfeldt both earned spots on the Honorable Mention Team as pitchers. Freeman owned a 2.97 earned run average along with a 3-6 record, allowing 29 earned runs in 68.1 innings pitched. Making 13 appearances and eight starts, Freeman recorded four complete games and 28 strikeouts. One of three first-years on the Honorable Mention Team, Neuenfeldt paced Gustavus in the circle, starting 14 games for the Gusties. In 67 innings pitched, Neuenfeldt notched 46 strikeouts compared to 24 bases on balls. Allowing 40 earned runs, Neuenfeldt finished with a 4.18 ERA and a 5-8 record. Melissa Barry of St. Thomas was named the Player of the Year, Ally Hjort of Saint Benedict was named the Pitcher and Rookie of the Year, and John Tschida of St. Thomas was named the Coach of the Year.